Have an interior design that feels very dull? Or you might have accidentally invested in too much grey and ended up with a space that looks too monotonous? Well, don’t worry; there are quite a few ways you can fix this problem. Making dull interiors bright and cheerful is a challenging but not impossible task, and further, we’ll be sharing with you 5 tips that can easily spice up your dull space! 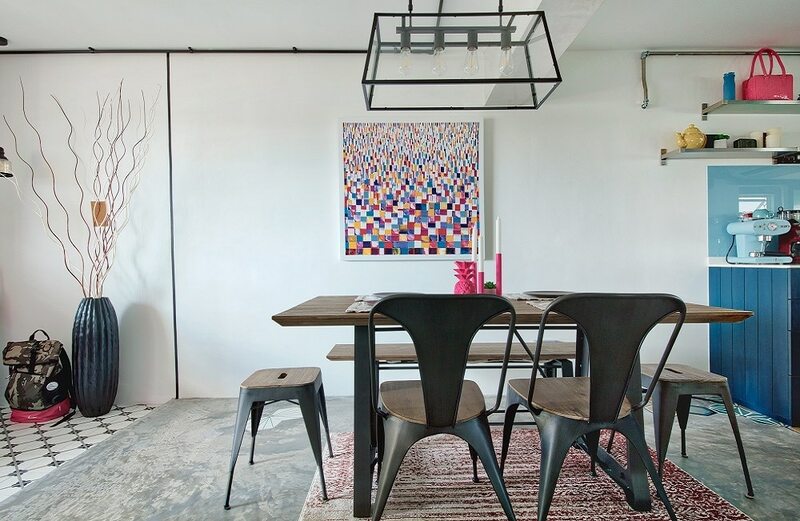 While accessories and artwork are all fine choices for adding a splash of color into boring interior designs, nothing beats a creative punch. You have to think out of the box if you want your space to stand out. 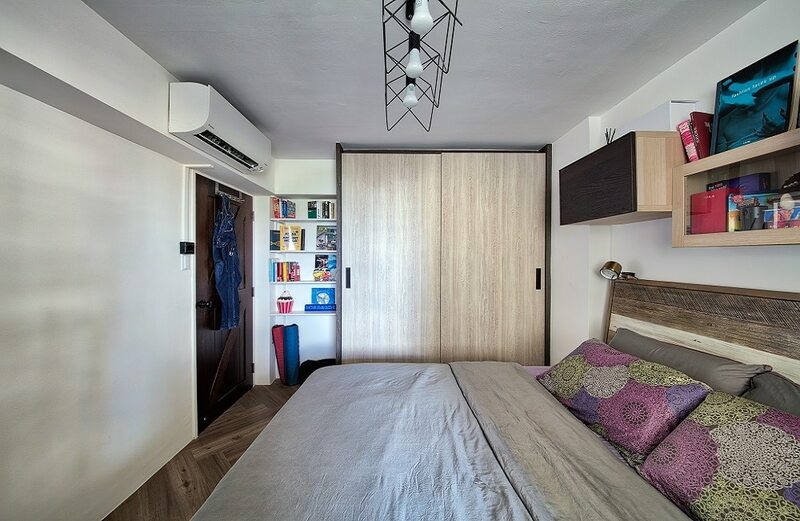 In this image, you’ll notice how the mostly grey-hued space has been spruced up with an expert blend of artwork, accessories and the crown jewel: the door. 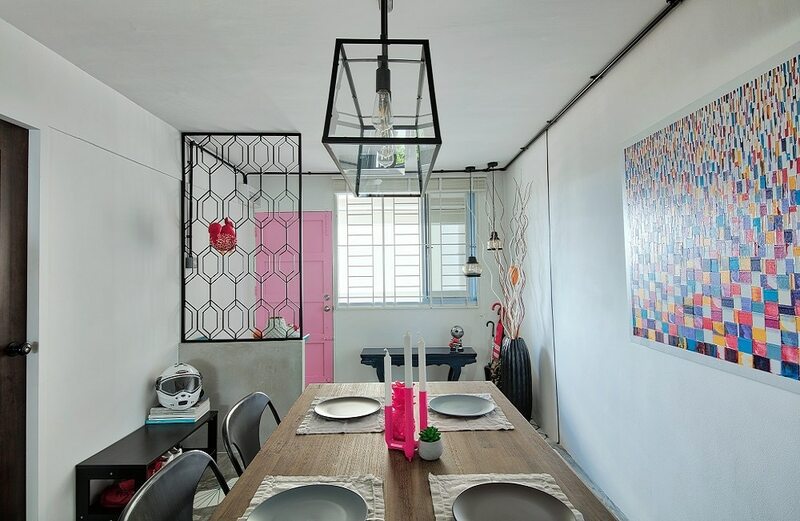 The baby pink paint on the door makes the whole space look eccentric and unique without compromising the elegance of the space! Throw pillows and ottomans are an extremely easy and cost-effective way to introduce a colorful vibe in your interior designs. However, you must always be careful while choosing the color combinations for these two elements. Make sure that the colors are bold, but nicely contrast each other as well. There are colors that are bold and dull at the same time. You can use them to add a bit of contrast in your monotonous interior designs. 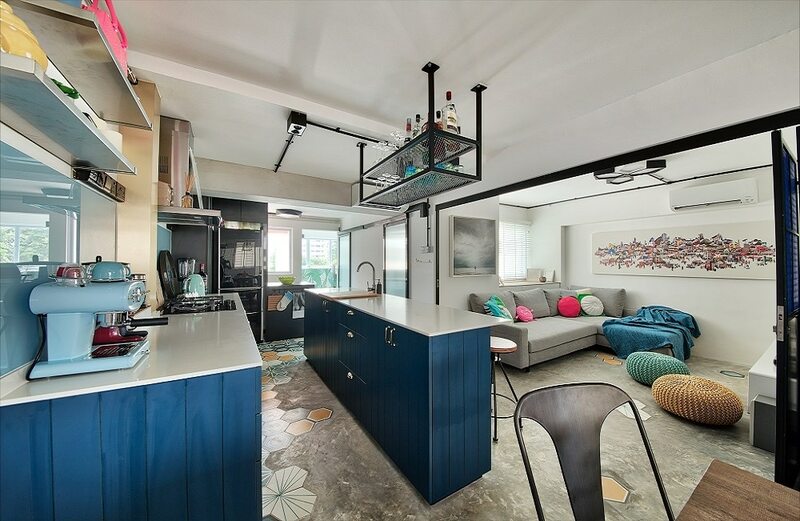 For example, in case of the image above, you can see how the introduction of navy blue color in the space completely transforms the entire ambiance of this open floor HDB design. You can get creative with the whole concept by introducing colorful accents with the help of stuff like bed covers, pillow covers, book spines and small decoration pieces. All these things may seem like small interventions, but they have a huge visual impact, so don’t underestimate their importance. The visual gradient can be utilized to measure the amount of colorful you introduced in an interior design. For example, the visual gradient in this image works from light to dark, with the rug being the lightest and the artwork centerpiece being the darkest. 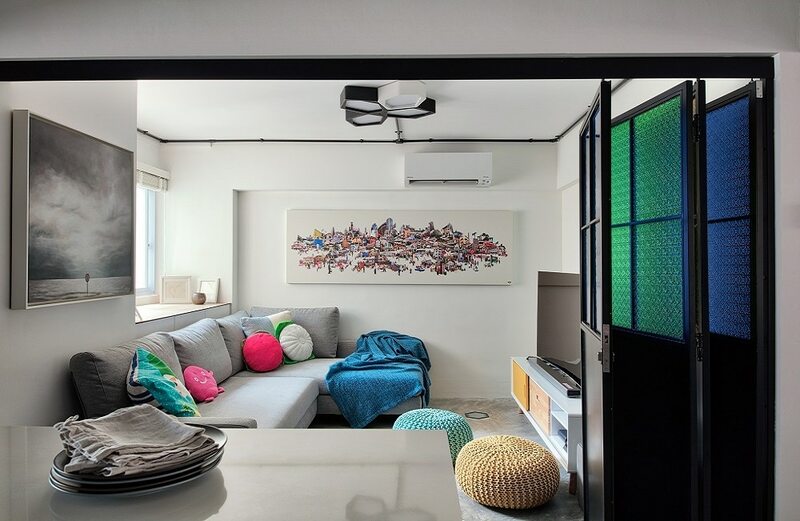 In such ways, you can control the amount of color you emulate in a specific space.